It is the natural instinct of a mother of any species to prepare a "nest" to welcome her baby. Though the natural instinct of nesting in humans is similar to other animals in the wild world, this form of nesting is highly advanced and powerful. As you are getting prepared for child birth, and before life becomes too demanding and challenging, . here are a few last minute preparations that you may want to put it into your to-do- list before labor and delivery set in. Restore your Fridge: Discard all out-dated items in your fridge and stock it with new and fresh items. Shop for and stock up key essentials like milk, yogurt, cheese, butter, fruits, vegetables and roasted chicken which will be easy to eat and handle once your new bornhas arrived. Stock Your Pantry: Ensure your pantry is stocked up with the staples as you won't be able to spend time at the grocery store once your baby is around. Line up your shelves with healthy, convenient foods that you can think of, from nuts to nutritious nibblers, particularly combined with dry fruits. Brown rice, whole grain crackers and cereals are also good options. Load your Laundry: Wash clothes that don't get washed regularly like all your curtains, pillow shams, throw rugs, guest bed sheets etc. Make sure everything around you is clean. Thorough Clean: It is time to tackle the tough cleaning that you have been putting off all this while. Clean your window sills, blinds and doors. Vacuum clean the floor and walls behind furniture and photo frames. Do not over strain yourself. If you are exhausted, ask somebody else to do it for you. Go shopping: Use a worksheet to create a shopping list for your baby with all kinds of new born essentials, like T-shirts, body suits, sweaters, and booties. Also, stock up with baby skin care products, a digital rectal thermometer and diapers. Get clothes for yourself: Prepare yourself with comfortable clothing, nursing accessories like nursing pads and nursing bras. Also, stock up some soft, breathable, oversized large innerwear that will make you feel comfortable during the first few weeks of pregnancy. 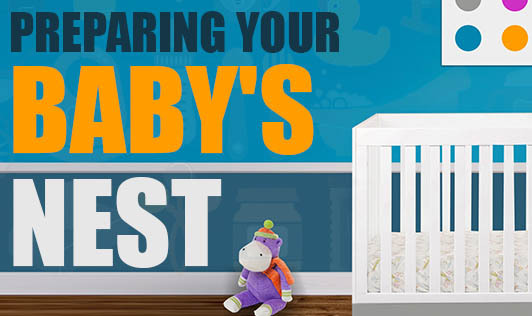 It is good to keep you and your surroundings ready and safe for your newborn's arrival.